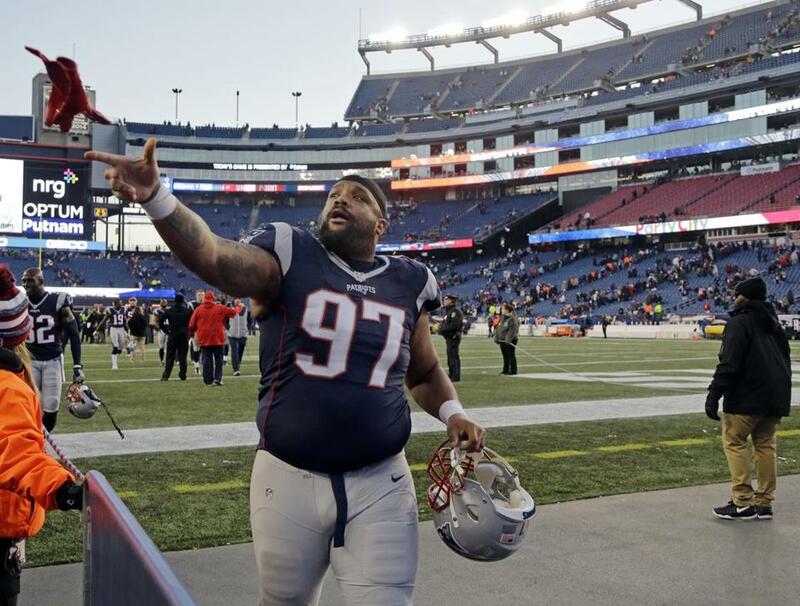 “I wouldn’t spend time away from my family to shake the hand of a guy I wouldn’t want to meet with or talk to,’’ said Patriots defensive lineman Alan Branch of President Trump. WASHINGTON — New England Patriots defensive tackle Alan Branch said he’s boycotting the team visit to the White House Wednesday in part because he was offended by President Trump’s sexist comments caught on an Access Hollywood video. Branch said he was horrified when he learned about the video, in which Trump was caught on a microphone talking about aggressively groping women and saying “when you’re a star, they let you do it.” Trump apologized for his language. Branch is among five members of the Super Bowl-winning Patriots team to skip the traditional White House ceremony because of Trump’s behavior or policies. Martellus Bennett, LeGarrette Blount, Devin McCourty, and Chris Long also have expressed dismay over Trump and aren’t going to Washington. A sixth member of the team, linebacker Dont’a Hightower, is not attending but hasn’t said whether the reason was rooted in politics. Also, James White, the running back who was credited for 20 of the 34 points the Patriots scored in the Super Bowl including the game-winning touchdown, has said he was “up in the air” about whether to attend. Trump watched the Super Bowl from a party at his exclusive Mar-a-Lago club in Palm Beach and afterward took to Twitter to congratulate the team. The president’s supporters drew gleeful parallels between New England’s stunning come-from-behind victory and Trump’s own unexpected win in November’s presidential election. The president associated himself closely with the team. He is personally close with key team leaders including owner Robert Kraft, who was recently spotted dining with Trump along with Japanese Prime Minister Shinzo Abe, at Mar-a-Lago. Branch, who recovered a fourth-quarter fumble in the Super Bowl that marked a turning point in the game and recently re-signed with the team, said that he hasn’t been subject to any pressure from Patriots leadership to attend the White House events. “They’re not forcing me to do anything,” Branch said. Branch previously said he would skip the White House event to spend time with his family, a reason he also emphasized to the Globe. “In the season, so much of my time is dedicated to playing and trying to win games. So I try to spend all the time I can with them,” he said. Branch said the Patriots who weren’t coming did not coordinate their decision, but he did say team members paid attention to the 2016 presidential election. Branch attended a previous Super Bowl championship ceremony at the White House when Barack Obama was president, in 2015. He said that he disagrees with Trump’s policies but that alone wouldn’t have been enough to prompt a boycott. The Access Hollywood recording, he said, represented something else: a gross misuse of power. “I don’t want anyone to think that because they are a celebrity they have the power to do anything they want,” Branch said. Other team members have given different reasons. Instead he’s set to be in Los Angeles Wednesday for an appearance with Netflix’s talk show host Chelsea Handler. Both are Trump critics and Bennett will be talking about “why it’s important for him to take every chance to make a positive impact,” according to a publicist for the show. McCourty and Long both appeared on a roughly three-minute video published by Green Stripe News, an outlet that produces videos “depicting true stories of people harmed by racism, bigotry, sexism, and xenophobia,” according to its website. Long, a defensive end, talked about his family. “When my son grows up, and I believe the legacy of our president is going to be what it is, I don’t want him to say, ‘Hey Dad, why’d you go when you knew the right thing was to not go?’” Long said.